These are our suggestions to stop your application getting filled with unneeded data. Next we recommend that you deactivate all your prior year elections. Go to the elections page, use the check all box to select all elections and then click the Deactivate button. This will just hide the elections from your main screen. If you ever want to get back and look at prior year elections, you can click the button right above that says View Inactive Elections. The next step is to make sure you have deactivate all users that should not have have access to the software anymore. Check the box next to the users to deactivate and click the Deactivate button. Make sure your account is not going to expire when you need it. 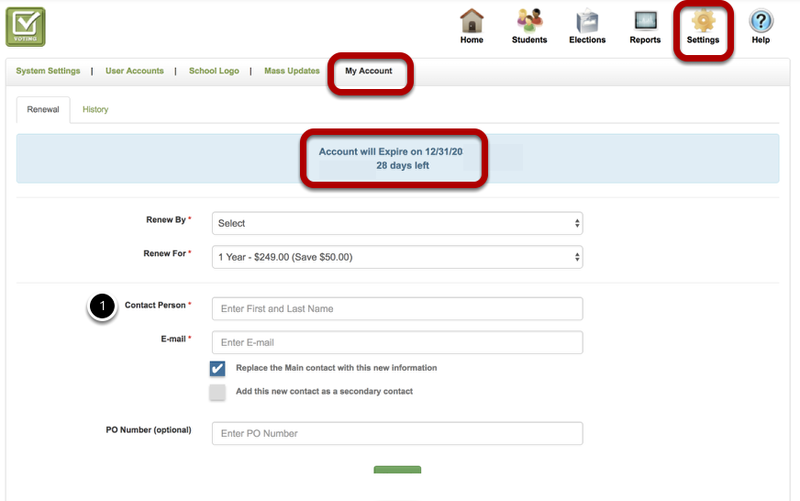 Go to Settings / My Account.You can see your account expiration date and even renew your account with a PO / Check or Credit Card right from this page. You can also update the main contact (ONLY When you renew) If you are not ready to renew and just want to update your contact for the school, please send an email to support@software4schools.com and include the original contact. Now that your application is all cleared out it is time to get ready for the upcoming school year. You will need to get a list of students. The list needs to include Student ID, First name, Last name and Voting Group (typically grade level) password (typically student birthday unless you have a password you can export) and E-mail (optional). 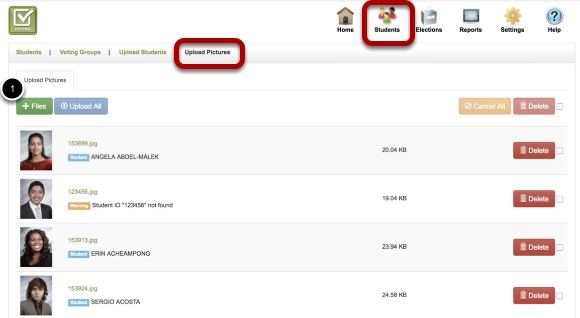 Under the Students Tab, go to Upload Students. 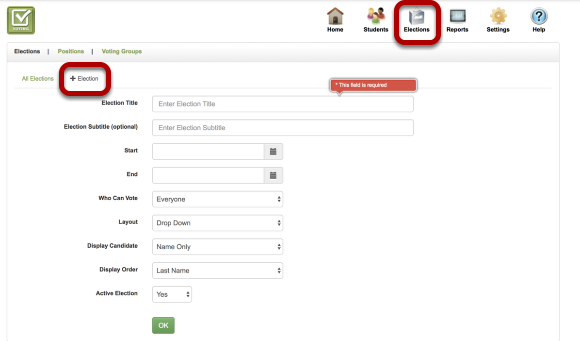 Click "+ File" and import your student file. To upload student pictures you can go to the next tab titled Upload Pictures. Usually your schools photographer will be able to provide you a file with your student pictures. As long as the file name for each student picture is their student ID number our system will match up the picture with the correct student. Just click the "+ File" to load your pictures. We recommend you only upload no more then 500 pictures at a time as this process can take a while. Thats it. Your Voting 4 Schools application is ready to go. You can now start creating elections. You can access more information about setting up election here.